The Carlten Stationary Living Room Group by Palliser at AHFA in the area. Product availability may vary. Contact us for the most current availability on this product. Fabric Options Available in a over 300 custom leathers and fabrics by special order. Pricing and availability may vary. Leg or Skirt Tapered exposed wood legs are featured in this collection of upholstered items. Arm Type A neat straight arm is accented by an X-shaped seam detail on the side of the couch, which adds to the contemporary style of the collection. Get the best of both worlds with a collection of living room furniture that offers you comfort without sacrificing style. Clean lines, unfussy style, and casual elegance all come together in the contemporary yet casual Carlten collection. 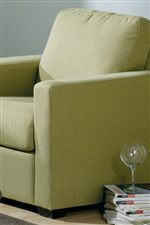 Unique X-shaped seams on the sides of the furniture create interest and add a modern accent to the collection. The classic modern shape suits today's urban style to a T, without being overwhelming or uncomfortable. The Carlten group features sofas and chairs that are as unique as you are. The Carlten collection is a great option if you are looking for Contemporary furniture in the area. Browse other items in the Carlten collection from AHFA in the area.